A new version of nxviz is released! In this update, I have added a declarative interface for visualizing geographically-constrained graphs. Here, nodes in a graph have their placement constrained by longitude and latitude. In the GeoPlot constructor API, the keyword arguments node_lat and node_lon specify which node metadata are to be used to place nodes on the x- and y- axes. 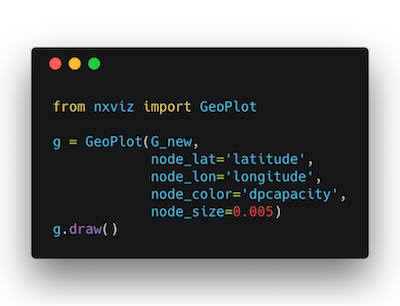 By no means do I intend for GeoPlot to replace more sophisticated analysis methods; like seaborn, the interface is declarative; for me, the intent is to provide a very quick-and-dirty way for an end user to visualize graphs with spatially constrained nodes.